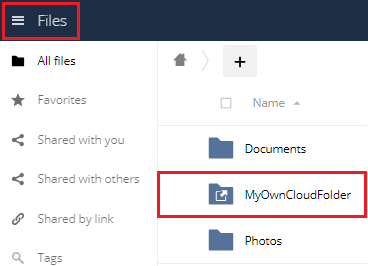 ownCloud is a free and open source file hosting application that provides universal file access, synchronization, and sharing of your data (using a single interface), regardless of where the data is located. You can access, sync, and share nearly anything such as contacts, calendars, bookmarks, and backups inside ownCloud via the web, your computer, or mobile devices. Since version 6.0, ownCloud allows you to use DreamObjects as an external storage option, which gives you total freedom and control over your data. This guide describes how to set up ownCloud to connect to DreamHost’s DreamObjects cloud storage service. 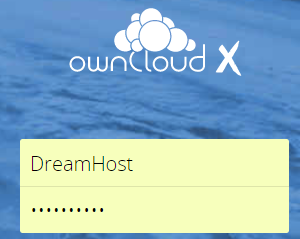 Before you can begin using ownCloud with DreamObjects, you must install ownCloud on your DreamHost server by following this step-by-step guide. Log into your ownCloud installation using your ownCloud administrator username and password. On the top right, click your username and select 'Settings'. In the left pane, select 'Storage'. Check the box titled 'Enable external storage' to connect to DreamObjects. 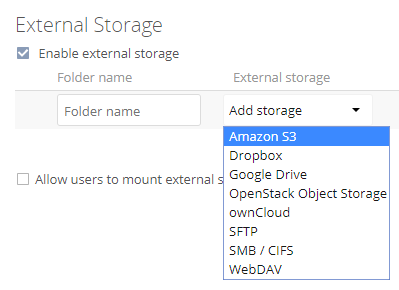 Click the dropdown titled 'Add storage' and select 'Amazon S3'. Under 'Folder name', enter the name of the folder you wish to create within your DreamObjects account. This will be the folder name you store your data in. This can be named anything you’d like. Bucket name — The name of your DreamObjects bucket. Your bucket name cannot contain an underscore as ownCloud will fail to connect. Access key — Your DreamObjects Access key. Secret key — Your DreamObjects Secret key. If you have multiple users of your ownCloud installation, you can limit who has access to the folder using the ‘Available For’ section to the right of the configuration information. If you've entered everything correctly, a green circle will appear to the left of your folder name. To see your files, Click 'Settings' on the top left, then click 'Files'. In the center pane, you'll see the name of the folder you created. Anything you keep, upload, or create there is stored in DreamObjects. Deleting an object inside ownCloud removes the object from DreamObjects. 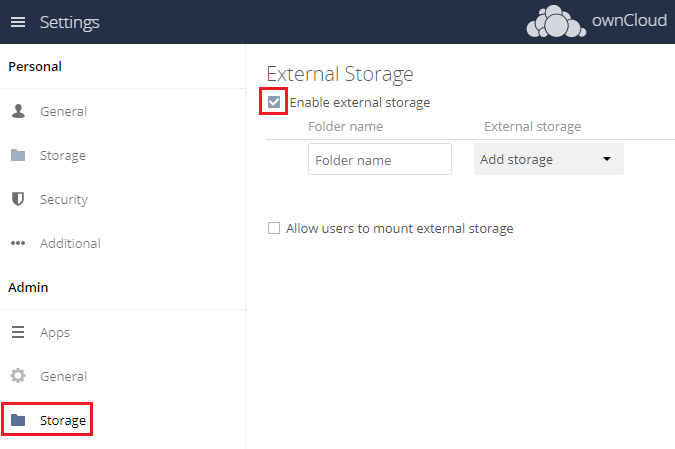 If you wish to connect additional buckets, simply create a new folder and connect this bucket to the folder via the ‘Admin > External Storage’ section of the ownCloud panel. 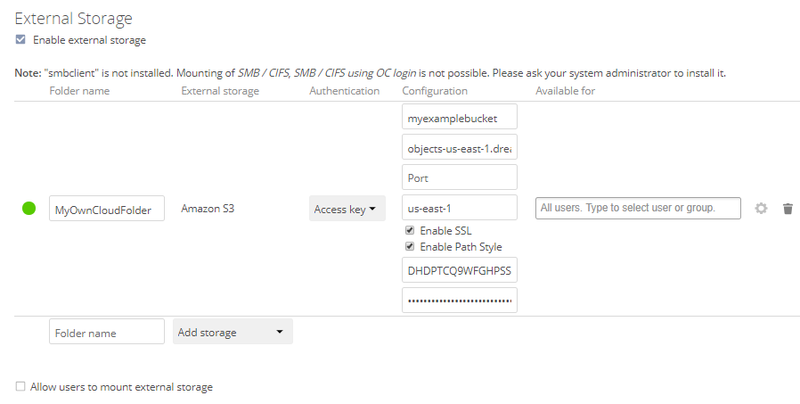 You can connect as many buckets as you like with ownCloud. If you plan to upload large files to DreamObjects using ownCloud, you’ll need to be aware of some limitations and make some configuration changes since uploading large files can be very memory intensive. A VPS with at least 1GB of memory is recommended, and required for extremely large file sizes. DreamObjects’ objects are limited to 10TBs in size, but must be uploaded in 5GB chunks. ownCloud does not support multi-part file uploads so you are limited to 5GB file uploads via ownCloud. If you intend to upload files larger than 513M, it’s suggested that the domain is configured to use the latest PHP version. You’ll also need to create custom PHP settings to set the desired upload size, execution time, and increased PHP memory usage. Start Storing Your Data Today! Article last updated April 08, 2019 21:24 PST.